Evaluation is always based on a) logical analysis, b) interrelation, c) basic knowledge o studied species behavior (fidelity, home ranges, movements, speed etc.). In breeding, feeding, stopover and wintering areas majority of birds is tied to a particular place and a restricted area. 1) Download Argos locations in a DIAG format. 2) Update continuously the database created for each PTT in a spreadsheet file. 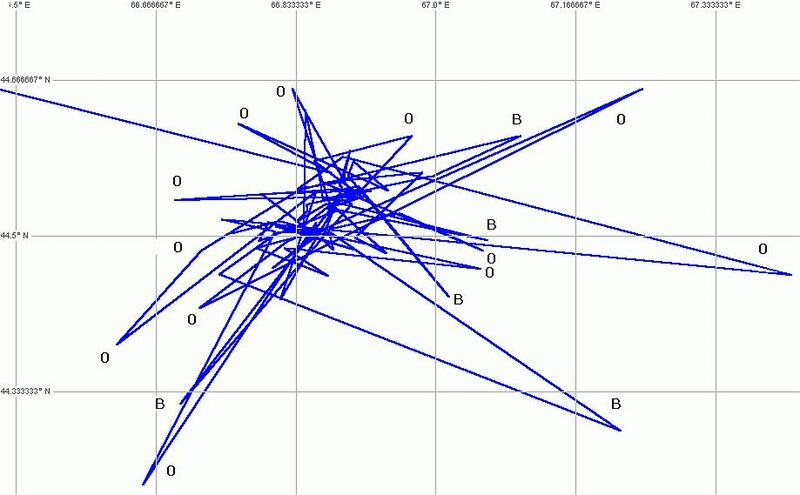 Each Argos record (LC 3,2,1,0,A,B,Z) spitted to all individual values in one line. Create also columns for real values of temperature and voltage (based on formula provided by manufacturer) and one column for "date&time numeric value". These full files are a base for all other evaluations (accepted locations, exact timing, analysis of PTT function etc.). 3) Reverse coordinates when reported by Argos in a wrong rank. 4) In additional columns (to the right) copy all necessary values in a structure identical to a GPS Track log file. I prefer the structure of Garmin III+ .GRM or .TRK files, as it is simple and can be used in many geographical programs together with own GPS data. Save this block in a .TXT format. 5) In .TXT file add necessary preamble (copied without change from other .TRK file), delete lines where LC Z with "??????" and also delete all extreme, evidently wrong coordinates. 6) Open this file in Oziexplorer (Configuration: GPS-GPS Model-Garmin III+; Garmin-PCX5 Support-Get Track from GRM File). Use blank map or use as background a calibrated map or a selected window from the Microsoft Encarta that is surprisingly accurate worldwide. 7) Look at deviations in the full track (but remember that the line is bypassing days when the PTT was OFF). In this "continuous" track in breeding sites, winter grounds or stopovers (and even in migration tracks) you can easy identify sudden erroneous excesses that form a star-like pattern. Delete from outside the largest "beam" deviations formed by only single location (do not care about their LC quality). Stop the reduction in a level where you cannot decide whether the distance of the single location from the "star core" area is an error or a possible visit of surrounding area. Real visits are mostly formed by a few or a small cluster of locations or these sites are visited repeatedly. In many species the limiting distance is about 5-10 km (look below: this distance is very often exceeded by seemingly good LC 0!, rather then LC B). 8) This kind of a raw track file is quit informative as places used for longer time are evident by larger "huddles" and it brings the impression of a "catchment area" created partly on true movements, partly on undistiguishable errors. Applying different limits the extend of this "catchment area" can reflect a known behaviour of studied species (e.g. Wintering black storks use very small area but they often soar in hot afternoons and in this time they can temporary fly over larger surroundings). 9) ) For comparison I select in separated files only the best LCs (1, 2, 3) and also only night locations from the file created after 7). Overlapping files can show interesting preferences. 10) On the base of this raw track file one can made the final interpretation track file with single points in all accepted locations and in the middle of clusters. For operations in 2) to 4) I use saved macro files. The map bellow shows the real distribution of locations (solar powered PTT, in this area 43x"0", 25x"1", 14x"B", 5x"A", 5x"2", 3x"3"). The extremes with depicted LC quality were deleted (12x"0", 5x"B"). East west distances 65 km, in the core area two clusters 6 km apart representing two preferred feeding sites.